Given My One and Only's highly literary synopsis that made me envision The Prize Winner of Defiance, Ohio combined with a mile a second plot-spoiling trailer that recalled His Girl Friday, I wasn't sure what to expect when I sat down to view Richard Loncraine's film. Moreover, I was further bewildered by analysis that likened Renée Zellweger's character to “a cousin of Blanche DuBois” in a movie that New York Times film critic Stephen Holden described as one that “aspires to be a contemporary version of a Preston Sturges comedy,” despite the fact that the film was set in 1953. However, I realized much to my delight that the movie works on several levels but in this case, none of the ones Holden addressed. 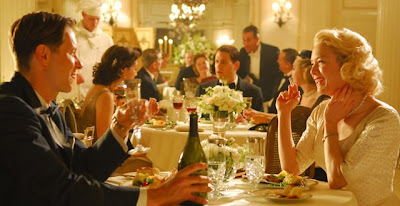 In my view, the movie's success lies in the way that it meanders from comedy to tragedy in a delightful confection as penned by screenwriter Charlie Peters. 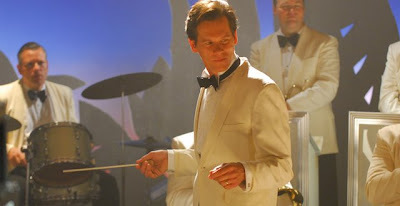 In one of Renée Zellweger's strongest turns to date, she channels Katharine Hepburn-- as she confessed in the production notes-- for her role as Ann Devereaux, a wealthy self-obsessed New Yorker who returns from vacation one day earlier than expected only to find her boyish band leader husband Dan (Kevin Bacon) entertaining another woman. Unwilling to fall to pieces like Tennessee Williams' Streetcar Named Desire damsel in perpetual distress, Blanche DuBois, Ann instead soldiers through the scene in classy Katharine Hepburn mode like Truman Capote's Holly Golightly as if directed by Billy Wilder. 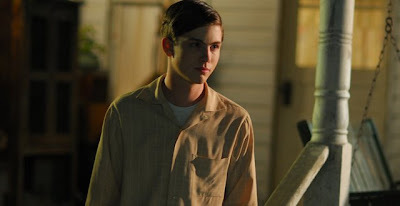 For she is a woman who lives by aphorisms, as her son George (3:10 to Yuma's Logan Lerman) explains to the car dealership where the teenager was sent by Ann to purchase them a getaway vehicle. No instead of tears or tantrums, Ann simply zips up the dress of the half-naked floozy and sisterly advises her that the color she's wearing makes her look like a tramp before she jokes that in that case it fits. Warning her adulterous husband that he shouldn't contradict a woman while in his underwear since it puts him at a great disadvantage, she takes all of the valuables out of their safety deposit box (including a gun and cash, which she replaces with her wedding ring), collects her two teenage boys after first arriving at the wrong school unsure which one they attend, and then hits the road. Initially Ann seems to be looking for her next meal ticket or husband to provide for her as with her social ease, friendly demeanor, beauty, confidence, and ability to adapt to all situations she has friends and old beaus in all the neighboring northeastern states. Yet Ann has trouble accepting reality a la Holly Golightly that it's not as easy to hunt for a new husband as it was when she was younger and minus two teenage boys. While there's no shortage of suitors or possibilities as various men come out of the woodwork including fine, brief turns by Chris Noth as an anti-communist military man, Eric McCormack, Steven Weber, and more, Ann quickly realizes that unlike DuBois she's going to have to stop depending on what she foolishly believes is the instant kindness of suitors and get a little more street smart like Tennessee Williams' wily “Maggie the Cat” from Cat on a Hot Tin Roof. Admittedly it's pretty dicey territory for an actress to tackle playing a mother who places her own needs first as a far more comedic pre-feminist Alice Doesn't Live Here Anymore piece when she selfishly uproots the boys from one location to the next, yet Zellweger is able to bring a quiet dignity to Ann Devereaux. Throughout the film, we understand that just below the character she puts on for the world, as though she were a woman applying makeup in the mirror to put on her war paint or game face to hide behind, Ann understands that she isn't the ideal mother and that she's just as confused and emotionally in need of growing up as her sons. Yet the difference between Ann and her husband is as we uncover in Kevin Bacon's very little but always memorable screen time, that at the end of the day, she wants to be with her boys and give them the style of life and idea of a two-parent family that society and her experience has always programmed her to idealize. On the other hand and despite his love for his biological son George, her husband is quite content to be a postcard and phone call type of father. Although narration can be the kiss of death for a movie especially when it's employed in a film as highly literate and sophisticated in its dialogue as this work, it's doubly daring when you consider that My One and Only is rooted in nostalgia. Like the Julianne Moore vehicle The Prize Winner of Defiance, Ohio chronicled a woman's tireless efforts to provide for her family as shared by her child, My One and Only is a fictionalized memoir of actor George Hamilton's true stories about life with his mother in the '50s combined with autobiographical and invented material culled from screenwriter Charlie Peters. 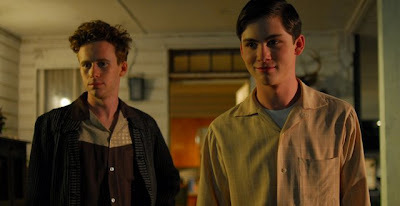 Yet, narration for this film works from the start as the extremely talented Lerman (playing the young George Hamilton) chronicles the adventures in a way that prevents the movie from feeling overly quirky or episodic as their journey on the road continues. Despite this, there are a few structural speed bumps including one usage of narration in a cliched “How I Spent My Summer Vacation” classroom scene that makes the cinematic mistake of repeating information orally that we'd previously seen visually (or in other words, telling us the same thing twice). But aside from a few overly predictable coincidences and offbeat characters who feel a touch too invented, overall it's a surprisingly charming film. Likewise, it's one that is bolstered by the strength of its believable ensemble cast. While I can't say enough for Lerman, critics definitely aren't kidding when they laud praise onto Zellweger who hasn't been this integral in the success and tone of a film since her triumphant work in Neil LaBute's underrated Nurse Betty. In a year where we haven't seen enough standout work with strong female leads, Zellweger may indeed receive yet another Oscar nomination as, no stranger to period films given her turns in Cold Mountain, Chicago, Leatherheads, Miss Potter and The Whole Wide World, the Bridget Jones' Diary star is the heart of the film and ensures we don't turn away from it even when we disagree with the actions her character takes. 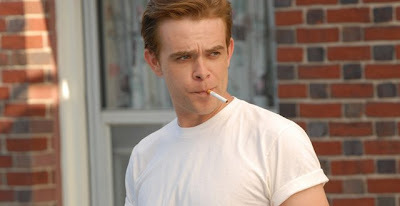 Likewise, she's equally matched and elevated by Lerman, Bacon and other performers including a nice brief portrayal by In the Bedroom actor Nick Stahl as a young blue-collar neighbor who may have been the most sincere man that Ann met in her travels. However, despite actor Mark Rendall's determination to do more with his stereotypically written effeminate one-note role as Ann's costume loving, cross-stitching son, his character Robbie whose love of movie divas becomes a source for humor a little too often. And unfortunately the usage of Robbie asks viewers to laugh at his “gay ways” instead of with him even if that wasn't most likely Peters' intention. Yet aside from the unfortunate characterization of Robbie which feels at times as anecdotal as the individuals the mom and her sons meet on their journey, My One and Only is a charming work that deserves a wider audience. Opening in limited release due to its independent background as a movie that survived over a decade of turnaround hell and false starts, Richard Loncraine's witty and heartwarming achievement sets its tone immediately via a terrific credit sequence to establish the time and place. Nicely leading into the season of more serious cinematic awards-bait, My One and Only is one little sleeper that will hopefully awaken a big enough audience to inspire a great word-of-mouth campaign. A must for fans of Zellweger who've been longing to see her in something with a bit more substance and zest than New in Town, My One and Only will also renew and in a great many cases encourage a whole new level of appreciation for the famously suntanned, Hollywood handsome George Hamilton whose life inspired the picture.